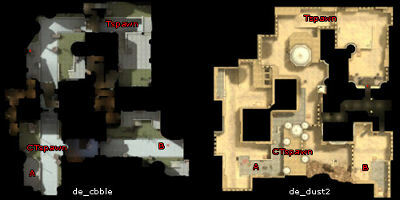 I came across an interesting blog entry by Luke Muscat who, having examined the layouts of Dust 2 and Cobble, has concluded that they bear a surprising amount of similarity. I had never seen nor noticed that before, but it’s certainly quite interesting. Of course, when you consider how the maps play, there is a huge difference and you’ll find the firefights are centered at different places, due to the distance differentials and the different geometry. It makes the point however that a good layout isn’t necessarily all that makes a map. There are more images and comparisons too. Still, it suprised me. Who knows, maybe my other maps are the same. Is Tides equivalent to Sienna…?